Special needs schools are schools that cater to students who have special educational needs, for example because of learning difficulties or physical disabilities. Special schools might be specifically designed, resourced and staffed in order to provide the appropriate education for pupils with additional needs. A child who may begin their education in mainstream schools will often be referred to a special education board if teachers or parents begin to notice problems with the students learning. With the parents consent the child in question will then undergo several assessments and evaluations. These assessments and evaluations will allow specialists to identify specific areas of learning difficulty, and advise accordingly. It is important to place the student in the right school, offering the appropriate skilled specialists and targeted instruction. Often Special Educational Needs are referred to as SEN.
On your journey to finding the right school for your child it is important to know as much as you can about each school that you consider. Firstly a visit must take place, here you can observe the school site and ask any questions you may have of the teachers and admissions staff. Ask to observe a class and a lesson. If this is possible, you will have a greater idea of how your child will learn and interact on a day to day basis. This will also help you see what type of methods they use to help individuals with different learning problems. What you are looking particularly is a stimulating learning environment, where students can feel safe and secure. Note the classroom walls to see if they contain past work, as brightly colourful and interesting classroom will help create a pleasant learning environment. Often SEN schools will have extra counsellors and support staff specifically trained to meet students needs. There may be a Special Educational Needs Co-ordinator who works in collaboration with both the head and governing body, in order for provisions to be made for individual children. 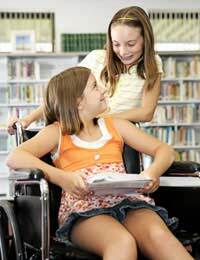 Various therapies are also offered on some school sites, such as speech therapy, occupational therapy and physiotherapy. These sessions are designed to help children with their individual physical and educational needs, so it's important to take the training of the staff of your chosen school into account. Like mainstream schools, there will be general medical facilities as well to make sure your child is kept healthy and safe. This will usually take the form of one or maybe several school nurses. Special Needs schools will have specific facilities which will cater for students. These may include hydrotherapy pools for example, which provide students with physical therapy, as well as recreation. Another feature that some schools may have is a specially designed play room with sensory facilities. Sensory rooms create an environment where experiences and stimulating activities are used which helps to increase awareness and positive behaviour for individuals. These rooms enhance skills for students, such as sensory development: hearing, smell, sight and touch, hand/eye coordination, language development and relaxation. Other facilities to look out for may include a swimming pool, interactive white boards and specifically built outdoor play areas. Sixth Form Study: IB or A Level?